Why Organic Seeds? It really IS so important! Is it really important to buy organic seeds, rather than non-organic? Are non-GMO seeds also organic? And what about organic hybrid varieties? And can an organic seed be treated? Is that so bad? These questions confound even experienced gardeners these days. Conventional commercial seed propagation methods utilize chemicals and other treatments that can leech into the soil, migrate to other plants, drain off into the ground water and eventually water supply, affect pollinators in a very profound way and, affect your health as well. Using conventional non-organic seed, even if it is non-GMO or untreated, is a poor start to an organic garden and can have lasting effects. This is why organic certification takes so long and is so expensive — the soil has to be redeemed from conventional assaults, and that typically takes 3-5 years, depending on the history of the growing area, surrounding areas, and type of soil and rainfall. More and more, people are recognizing that organic produce not only tastes better … it is better — healthier, with more vitamins, nutrients and protein than conventional produce. But it is also important to grow your herbs and flowers organically, and for that you also need organic seed. Hybrids, by the way, are not genetically modified. They are simply produced using natural methods. Many heirloom varieties began as hybrids that have been “stabilized” so that they are now “open-pollinated” — in other words seed gathered from them will grow true to the parent as long as no cross-pollination has occurred. So hybrids are not wrong, they just are not yet of the stability that you can save the seed. Also, most modern hybrid varieties are created for the convenience of growers and grocers, not for superior flavor or other characteristics that home gardeners value. Certified organic seed cannot be genetically modified, so anytime you purchase certified organic seed you are also purchasing non-GMO seed. But that seed might be treated to ward off fungal diseases when sown in cold wet soils. The “fungicides” most commonly used by such commercial growers are Thiram, which has been around for decades, and Apron and Maxim, newer brands. You should know a seed has been treated if it is brightly and unnaturally colored — hot pink, for example. You should not handle such seed with bare hands. These chemical coatings can cause kidney and liver damage when used over time, and they are acutely toxic to fish, so runoff can be poisonous to the environment. And since their purpose is to protect vast growing fields, a home gardener does not need them, and an organic gardener should never use them. But more recently, systemic pesticides have become common among commercial growers. Known by their scientific name as Neonicotinoids, they are pushed by Bayer, Sygenta and Monsanto and have now unquestionably been linked to bee death. You see, this type of systemic poison not only affects the plant it produces, it leaches and migrates in the soil to surrounding plants. So importing just one beautiful flower from your local nursery can create a toxic zone in your otherwise organic garden. Some commercial nurseries have pledged to, or stopped altogether, offering plants that are grown with neonicotinoids. We encourage you to ask your local nurseries what their practice is. So, that brings us full circle as to why Organics matter. They are healthier and safer for you and the planet and all God’s creatures. This is why CherryGal Heirloom Seeds has gone ALL ORGANIC for the 2017 season, and we never offer treated seeds. In fact, we are signatories of The Safe Seed Pledge. Happy Gardening! 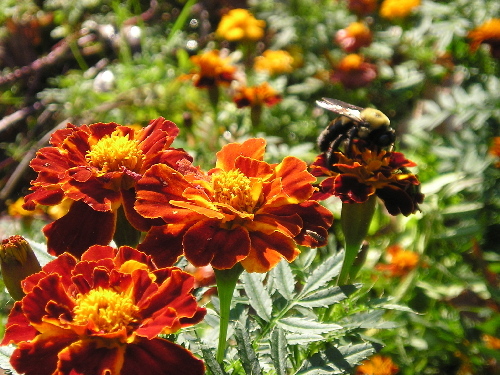 This entry was posted in Garden, Health and tagged bee colony collapse, Organic gardening, organic seeds by Cherry Gal. Bookmark the permalink. do a good job explaining the whatever topic you’re blogging about.